Jungle Red Writers: Write What You Know? Or...Who knows. Yesterday, renowned publicist Maryglenn McCombs gave us a master class in marketing. Today--she gives us perfect blend of content and publicity and insight. Mystery writers: should you write what you know?How about writing what you can teach? One of the most familiar pieces of advice for writers is “write what you know.” But as familiar as it is, “write what you know” is also hotly-debated. Scholars differ as to whether or not this is good writing advice. But in a February, 1998 interview with Publishers Weekly, Nora Roberts took a different stance: “I know they say, 'Write what you know’ but I write what I want to know." Whether a writer chooses to stick to the familiar or research the unknown, maybe the best piece of advice is the JungleRedWriters motto: writing well is the best revenge. After all, who would want to argue with either the Queen of Suspense or the Queen of the Romance novel? I love mystery/suspense/thriller fiction—not just as a book publicist, but also as a reader. If I were forced to pick a side, I think I would vote ‘yes’ on “write what you know.” Why? I love a good crime fiction novel that has an element of the author’s experience included—whether it is a doctor who writes good medical suspense, a lawyer or judge who writes a good legal thriller, or an investigative reporter in Boston and recent Anthony, Agatha, and Macavity award-winner (who shall go nameless) who writes excellent mysteries about an investigative reporter. MARYGLENN: There is something intimate about getting a behind-the-scenes look at what an author’s world is really like. And I love to play the guessing game of what’s real and what’s simply the product of an author’s imagination. It’s been said that the truth is stranger than fiction, after all. What started me thinking about “write what you know” is an outstanding mystery I recently read, Did Not Survive by Ann Littlewood. Ann, who was a zookeeper at the Portland Zoo for over a decade, used a fictional zoo as the setting of Did Not Survive and her first mystery, Night Kill. Ann is clearly writing what she knows—and it’s apparent in the detail included in the book. But after reading Did Not Survive, (in the interest of full disclosure, Did Not Survive is a book I am representing) I started thinking that Ann took “write what you know” in a whole new direction—and wrote what she could teach. Apart from being an excellent novel, Did Not Survive is fascinating and filled with great details about zoos, animal rights activists, endangered species, animal behavior, and the bonds between humans and animals. After I had found out whodunit, and closed the book, I kept thinking about it. And I’m still thinking about it. 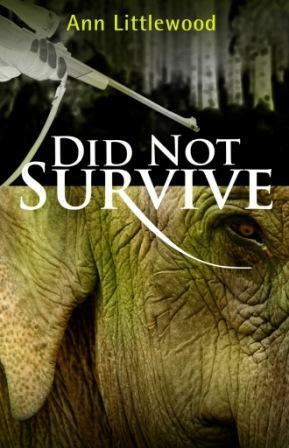 The protagonist in Did Not Survive is Iris Oakley, a zookeeper who is thrust into extraordinary circumstances when she tries to rescue her boss being mauled to death by a reliable old zoo elephant. Lest I spoil the plot, it is questionable whether the elephant attacked and Iris is soon relegated into the role of amateur sleuth to find answers. No spoiler here, but investigating turns out to be, well, dangerous. In addition to a colorful cast of human characters, Did Not Survive also features an exotic ensemble of animal characters, including Clouded Leopards, Spectacled Owls, a tiger named Rajah, and Damrey and Nakri, two Asian elephants who are central to the mystery. I walked away from reading Did Not Survive with a whole new appreciation for elephants, and definitely more of an understanding about animals, and zoos, than I had before I picked up the book. And maybe the next time the topic of zoos or Clouded Leopards or Asian elephants comes up in conversation, I’ll have something interesting to add. I am all for reading books for pure entertainment, or good old escapist fun, but I also like the feeling that I learned something in the process. That’s precisely what separates a great book from an outstanding book, in my mind. Did Not Survive earns an “outstanding” from me, as the book and the details therein, are going to stay with me. Ann Littlewood says she created her series of “zoo-dunnits” with the hope of educating people about animals and their difficulties in today’s world. I say she succeeded. Writers, what do you think about writing what you know, or writing what you can teach? Till then, I think I should stick to promoting books. Gosh, Hank! I'm blushing. Thank you so much for your kind words--and thanks again for hosting me! Oh, you're amazing. We love having you. I never liked the statement, "Write what you know." If Agatha Christie followed that advice, would she have written about a Belgian detective with OCD? As a writer, I have discovered I have to know little tidbits here and there. I think that's why I rock at Trivial Pursuit. I would be curious if there is a correlation between writers and writers being good at Trivial Pursuit. Maybe it is because writers are also avid readers. I think writing what you love (know) or what you love'd to learn shows up in tangible and intangible ways in your writing. Readers can connect to the underlying enthusiasm and, as a reader, I like to learn something I know nothing about. Great comments! Thank you all so much! Melissa, I'm a disaster at Trivial Pursuit, so I hope that's not the only predictor of good writing! I always have some kind of psychology in whatever I write. That's my background and it simply comes out. Besides that, I feel I have an insider's view into what happens psychotherapy and I enjoy sharing that. Almost all my neurotic characters end up in therapy and it almost always helps:). thanks for visiting with us again Maryglenn and raising an interesting question! I did that with my first book (hey it ws fun and it meant less research) but each subsequent book has had a little more of something else I wanted to know more about - native american communities on the east coast, gambling, how to disappear. It's interesting,unless you get too married to your research and feel the need to stick it all in! I love all of this great feedback, and am so appreciative of you all commenting. It is great to get a different take on "write what you know." I will say that some of the most fascinating people I know are writers. There is nothing better than going to a writers conference and being surrounded by writers! I think the "write what you know" depends on what it is you know. I can see how someone in a medical profession would have an easier time of writing medical thrillers than I would. But, being someone who loves to learn about things, I won't rule out writing one somewhere down the line. With enough research, you could write what you "know" about nearly anything. Thank you so much for the comment (and compliment!) Glad you enjoyed the post. I think you make a great point. If I were to write a novel, I think I would definitely have to go out and learn something new, as I'm not sure what I know would make for an interesting book! I'm definitely going to stick to promoting books for the time being. I think it's easier to write what you know, then you can write what you want to learn because you care enought to learn something. It's the write what you fear one that bothers me. I do tend to write what my characters fear. The hardests one for me is to write what I don't know that I really don't want to know. So now that I think about it, why do I write mysteries with murder and voilence? I really don't want to know about it. I guess I blend it out with that HEA that I need for my characters. I love your analysis, Pat. I have a whole lot of admiration for anyone willing to write what he or she fears! I sometimes have to ask mystery writers I work with: now WHERE did you come up with that?